"Hi, my name is Zachary Vex and this is my hand, somewhat mangled from the rooftop cat rescue last night, but today we are going to demo the Box of Rock..."
Last edited by modman on 23 Jul 2007, 15:24, edited 1 time in total. Okay then - what is this last mosfet gain stage? I found it funny that Zach Vex copied the 'back end' of the BSIAB component-for-component. Is this really correct? If so, I don't resent it, I posted the schematic, after all. I'm actually kind of flattered that he used it. Thank you, igloo, looks cool to me! I think it's quite funny. Every time you buy a zvx you are basically buying a multiple of the SHO - x2 x3 x4! C'mon Z give us something to get excited about! Hey Igloo thanks for perf layout. Is it verified? It is a new draw. Two people have carefully checked it and it looks good. See at the top of the thread the schematic? I cannot see any layout??? The original schematic at the top of the thread cannot be correct with that 10n in the tone control surely??? I think it needs to be 100n - to match the BSIABII circuit - can someone confirm please!!! as soon as somebody verify the actual values used in the commercially available units, i will update the schematic and post it here for everybody's reference. .. thanks guys for the info. someone please verify the actual values so we could update the schematic posted. If the Zvex Octane schematic shows the real content of the unit, then i assume, Zvex never has seen a real unit, only the printed schematic which contains mistakes. 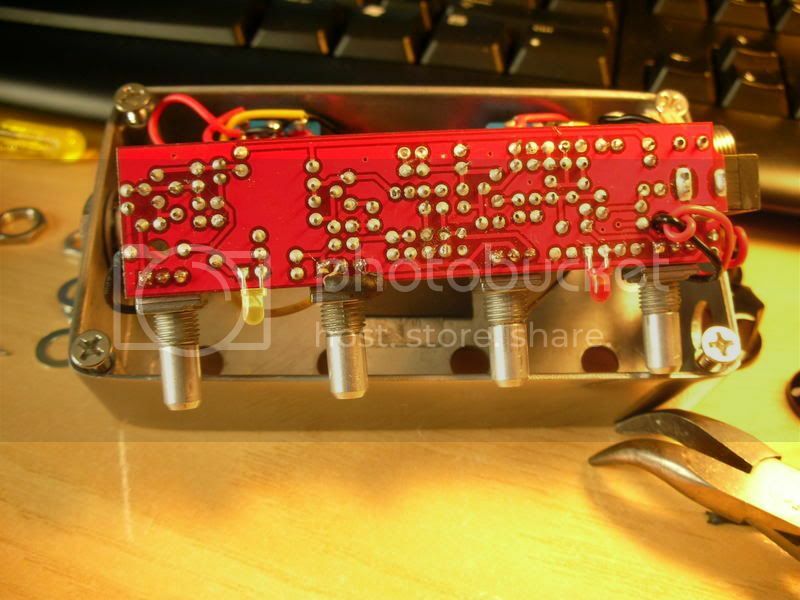 Also the printed Kay Fuzztone schematic supplied with the unit is incorrect. If you take this schematic for cloning...it wil never be a real clone. Sunn Buzz factory schematic is incorrect....the list can be continued. Since the output capacitor is 10µF (nobody knows why) it doesn´t make a difference to the unit itself if the output resistor is 47k or 100k. (even with only 47k the LF-response will be linear down to approx. 2 Hz and the load difference on the output stage is neglicible). 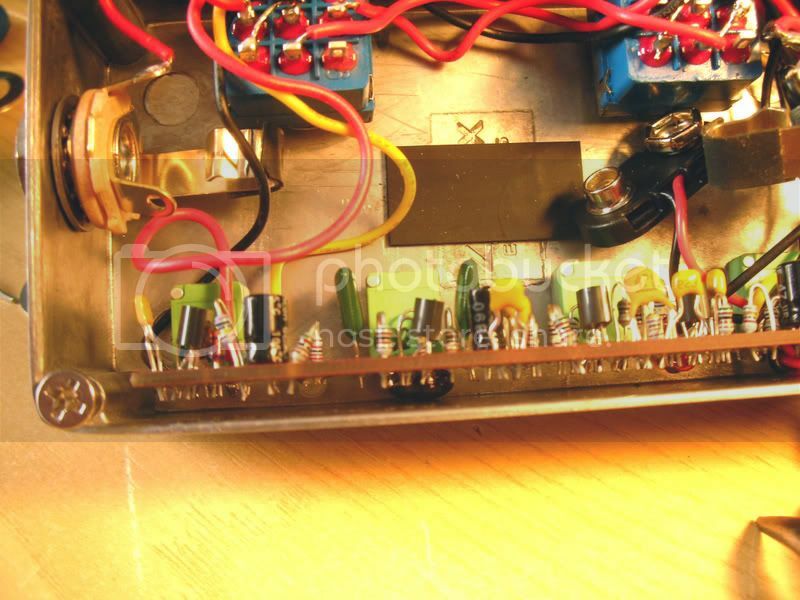 Maybe it can have an influence on the following guitar amp if this guitar amp has no DC-decoupling and no 68k input resistors.....only then. I've got a verified pcb layout of the dirt side of the schematic (I didn't put the boost in) if anyone is interested and it's kosher. I've built it but not boxed it so it's verified. madbean wrote: I've got a verified pcb layout of the dirt side of the schematic (I didn't put the boost in) if anyone is interested and it's kosher. I've built it but not boxed it so it's verified. I was going to do mine without the boost too. 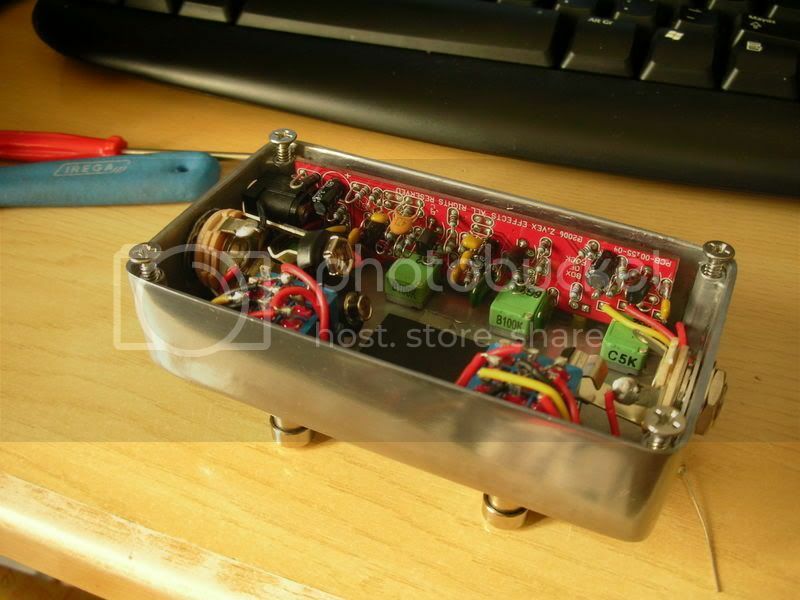 On th first pic there's a resistor added (not in the original) to the volume pot in order to "taper" from linear to audio. Interesting that ZV switched to Fairchild BS170. I was on the NS-site and IMHO they don't manufacture those Mosfets anymore. I know it is more ££'s, etc, but a Super Duper 2 in 1 (or a SHO) in front of the Box of Rock is a wonderful thing. The BoR responds wonderfully to it, and really does give you full on gain that is controllable from your volume. Maybe that'll be the next design - just keep adding SHOs!